The American Institute of Mathematics (AIM) seeks to encourage the adoption of open source and open access mathematics textbooks. The AIM Editorial Board has developed evaluation criteria to identify the books that are suitable for use in traditional university courses. The Editorial Board maintains a list of Approved Textbooks which have been judged to meet these criteria. All of the books below, organized by course title, have been judged to meet the evaluation criteria set by the AIM editorial board. 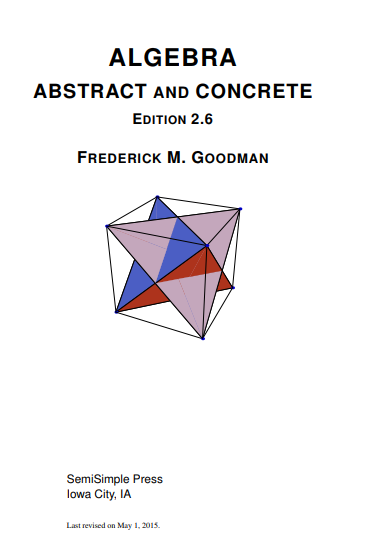 Algebra: Abstract and Concrete, by Frederick Goodman, provides a thorough introduction to "modern'' or "abstract'' algebra at a level suitable for upper-level undergraduates and beginning graduate students. The book addresses the conventional topics: groups, rings, fields, and linear algebra, with symmetry as a unifying theme. Important note: the author reserves all rights to this work. However, individual readers, classes or study groups may copy, store and print the work, in whole or in part, for their personal use. Any copy of this work, or any part of it, must include the title page with the author’s name and this copyright notice. No use or reproduction of this work for commercial purposes is permitted without the written permission of the author. This work may not be adapted or altered without the author’s written consent. 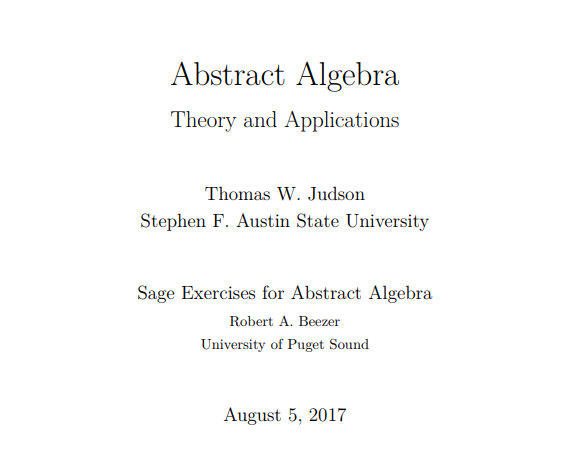 Abstract Algebra: Theory and Applications. 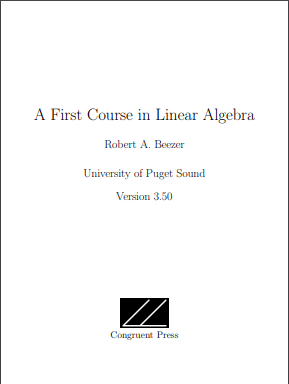 The content of this book is traditional for a first course in abstract algebra at the junior or senior level. It may be used for either one or two semesters. The exercises include both computational and theoretical and there are a number of applications. Hints or short answers are given to most problems but not fully written solutions. License: This textbook is licensed under a GNU Free Documentation License, which allows users to the rights to copy, redistribute, and modify a work. All copies and derivatives should be available under the same license. 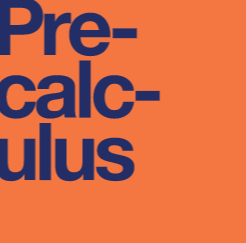 Calculus is designed for the typical two- or three-semester general calculus course, incorporating innovative features to enhance student learning. The book guides students through the core concepts of calculus and helps them understand how those concepts apply to their lives and the world around them. Due to the comprehensive nature of the material, this book is offered in three volumes for flexibility and efficiency. Click on the volume number to see each textbook and its ancillary resources. 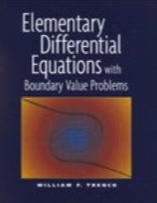 Volume 1 covers functions, limits, derivatives, and integration. Volume 2 covers integration, differential equations, sequences and series, and parametric equations and polar coordinates. Volume 3 covers parametric equations and polar coordinates, vectors, functions of several variables, multiple integration, and second-order differential equations. Where many texts present a general theory of calculus followed by substantial collections of worked examples, we instead pose problems or situations, consider possibilities, and then ask students to investigate and explore. Following key activities or examples, the presentation normally includes some overall perspective and a brief synopsis of general trends or properties, followed by formal statements of rules or theorems. While we often offer a plausibility argument for such results, rarely do we include formal proofs. Click on the book cover to access multiple formats of the textbook. 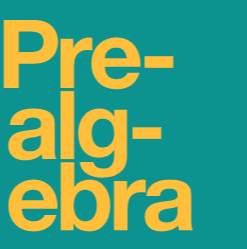 Prealgebra is designed to meet scope and sequence requirements for a one-semester prealgebra course. The book’s organization makes it easy to adapt to a variety of course syllabi. The text introduces the fundamental concepts of algebra while addressing the needs of students with diverse backgrounds and learning styles. Each topic builds upon previously developed material to demonstrate the cohesiveness and structure of mathematics. Instructor resources are available upon request. 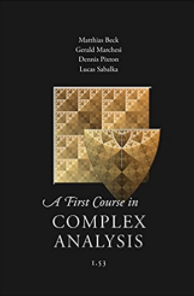 For many of our students, Complex Analysis is their first rigorous analysis (if not mathematics) class they take, and this book reflect this very much. We tried to rely on as few concepts from real analysis as possible. In particular, series and sequences are treated from scratch, which has the (maybe disadvantageous) consequence that power series are introduced late in the course. The goal our book works toward is the Residue Theorem, including some nontraditional applications from both continuous and discrete mathematics. Important license note: Copyright 2002-2017 by the authors. All rights reserved. This book may be freely reproduced and distributed, provided that it is reproduced in its entirety from the most recent version. This book may not be altered in any way, except for changes in format required for printing or other distribution, without the permission of the authors. A one semester first course on differential equations, aimed at engineering students. Prerequisite for the course is the basic calculus sequence. 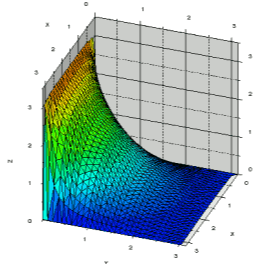 This free online book (e-book in webspeak) should be usable as a stand-alone textbook or as a companion to a course using another book such as Edwards and Penney, Differential Equations and Boundary Value Problems: Computing and Modeling or Boyce and DiPrima, Elementary Differential Equations and Boundary Value Problems (section correspondence to these two is given). License: This work is dual licensed under a Creative Commons Attribution-Noncommercial-Share Alike 4.0 License and Creative Commons Attribution-Share Alike 4.0 License. 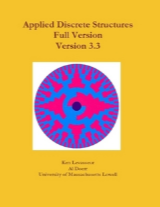 This textbook contains the content of a two semester course in discrete structures, which is typically a second-year course for students in computer science or mathematics, but it does not have a calculus prerequisite. 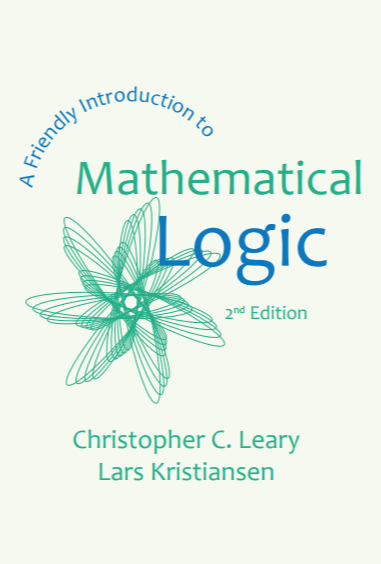 The material for the first semester is in chapters 1-10 and includes logic, set theory, functions, relations, recursion, graphs, trees, and elementary combinatorics. The second semester material in chapters 11-16 deals with algebraic structures: binary operations, groups, matrix algebra, Boolean algebra, monoids and automata, rings and fields. 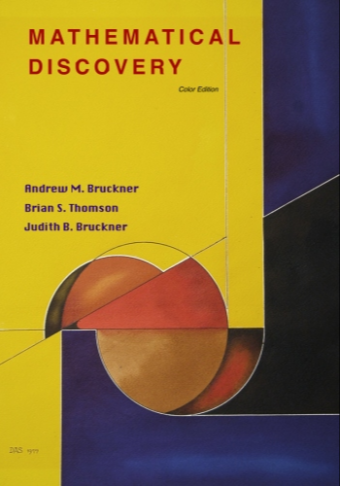 This open source textbook is being used at the University of Northern Colorado in a discrete mathematics course taken primarily by math majors, many of whom plan to become secondary teachers. This text can also be used in a bridge course or introduction to proofs. The major topics are introduced with Investigate! activities designed to get students more actively involved and which are suitable for inquiry based learning. 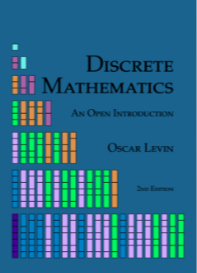 Discrete Mathematics: An Open Introduction by Oscar Levin is licensed under a Creative Commons Attribution-ShareAlike 4.0 International License. Geometry with an Introduction to Cosmic Topology offers an introduction to non-Euclidean geometry through the lens of questions that have ignited the imagination of stargazers since antiquity. What is the shape of the universe? Does the universe have an edge? Is it infinitely big? 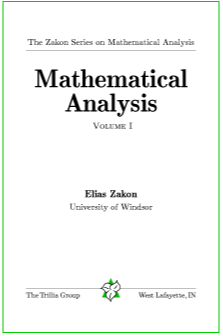 This text is intended for undergraduate mathematics and physics majors who have completed a multivariable calculus course and are ready for a course that practices the habits of thought needed in advanced courses of the undergraduate mathematics curriculum. The text is also particularly suited to independent study, with essays and other discussions complementing the mathematical content in several sections. License: Copyright by author: all rights reserved; you can print copies for personal use. GIAM is licensed under the GNU Free Documentation License version 1.3. 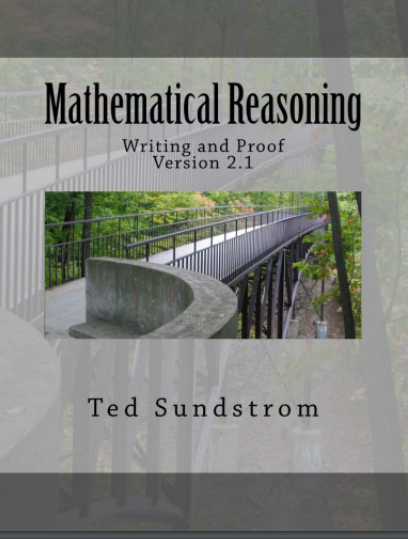 Mathematical Reasoning: Writing and Proof is designed to be a text for the ﬁrst course in the college mathematics curriculum that introduces students to the processes of constructing and writing proofs and focuses on the formal development of mathematics. This book is a survey of contemporary mathematical topics, most non-algebraic, appropriate for a college-level quantitative literacy topics course for liberal arts majors. The text is designed so that most chapters are independent, allowing the instructor to choose a selection of topics to be covered. Emphasis is placed on the applicability of the mathematics. Core material for each topic is covered in the main text, with additional depth available through exploration exercises appropriate for in-class, group, or individual investigation. This is a book about mathematics appreciation via discovery, rather than about practical mathematics. It considers several problems that don't appear to be amenable to ordinary arithmetic, algebraic or geometric techniques. It then guides the reader through the process of discovering the solution to each problem, using creative methods and simple techniques that arise naturally. It also indicates how each solution leads to new questions, provides a bit of history of the problem, and discusses a few related problems of current interest that have not yet been solved. 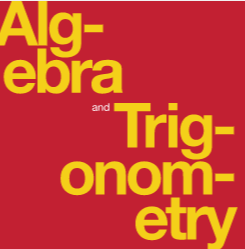 This book is a well-organized text with carefully constructed examples, a full quota of exercises with solutions, and an emphasis that is algebraic rather than geometric. The book is Sage-enabled with approximately 90 examples of Sage code spread throughout. The book sections can be loaded into Sage as worksheets so that the code can be evaluated immediately; however, it is not necessary to use Sage in order to make use of this textbook. License: Permission is granted to copy, distribute and/or modify this document under the terms of the GNU Free Documentation License, Version 1.2 or any later version published by the Free Software Foundation; with no Invariant Sections, no Front-Cover Texts, and no Back-Cover Texts. A copy of the license is included in the appendix entitled GNU Free Documentation License. From the American Institute of Mathematics: "This book has the standard content of a course for science, math, and engineering students that follows calculus. 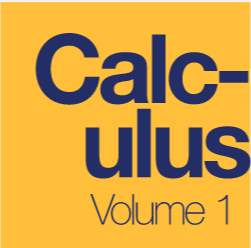 A semester of calculus is the explicit prerequisite, but most students would have three semesters of calculus and for them some of the beginning sections of the book can be skipped. Each chapter ends with three or four applications of that chapter’s subject." 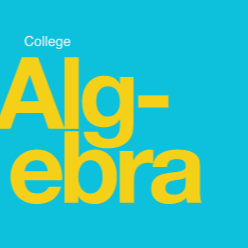 From the American Institute of Mathematics: "Brown University has two introductory linear algebra courses. This text is used in the honors course that emphasizes proofs. 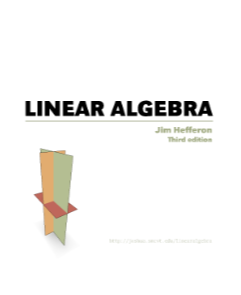 The book’s title suggests that it is not the typical approach to linear algebra even among those books that are more theoretical. For example, the concept of a basis is treated as more fundamental than the concept of linear independence, and linear transformations are introduced before solving systems of linear equations. Especially noteworthy is the motivation and development of determinants." License: This book is licensed under a Creative Commons Attribution-NonCommercial-NoDerivs 3.0 Unported License. At the intersection of mathematics, computer science, and philosophy, mathematical logic examines the power and limitations of formal mathematical thinking. 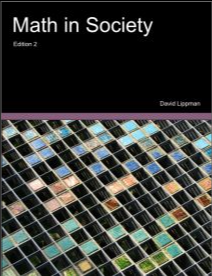 In this expansion of Leary’s user-friendly 1st edition, readers with no previous study in the field are introduced to the basics of model theory, proof theory, and computability theory. The text is designed to be used either in an upper division undergraduate classroom, or for self study. Updating the 1st Edition’s treatment of languages, structures, and deductions, leading to rigorous proofs of Gödel’s First and Second Incompleteness Theorems, the expanded 2nd Edition includes a new introduction to incompleteness through computability as well as solutions to selected exercises. Print copies available on Lulu.com, IndiBound.com, and Amazon.com. License: This work is licensed under a Creative Commons Attribution-NonCommercial-ShareAlike 3.0 Unported License. "This textbook serves admirably as an introduction for newcomers to Sage as well as a reference for those with some experience. It is written in an engaging and informal style and does an excellent job in explaining how Sage works. 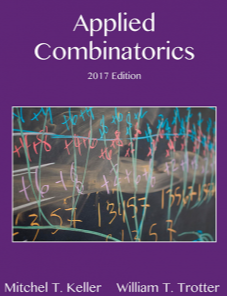 The book can be used profitably as an auxiliary text in any undergraduate mathematics class with a computational component, and it can be used in the mathematical software courses that are becoming more common, especially for math majors." "This book was developed as the text for a first course in numerical analysis at Southern Connecticut State University as an open source alternative to a classic text such as Burden and Faires. The first five chapters make up the content of a semester course. The style is engaging and conversational. As the author writes in the preface: “Much of the material will be presented as if it were being told to a student during tea time at University, but with the benefit of careful planning.” The exercises are plentiful and well-designed, and many of them have extensive solutions." 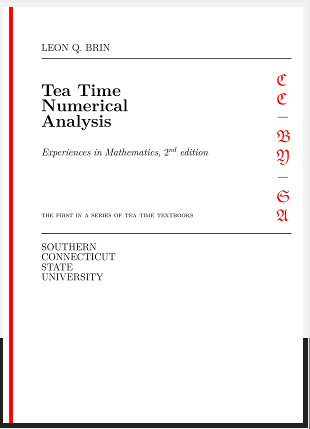 License: Tea Time Numerical Analysis by Leon Q. Brin is licensed under a Creative Commons Attribution-ShareAlike 4.0 International License. Although this book is published commercially by Cambridge University Press, who has the exclusive right to distribute it in print form, the publisher has granted access to a free PDF version that individuals can download, use, and print." Our book emphasizes the use of computing to simulate experiments and make computations. We have prepared a set of programs to go with the book. We have Mathematica, Maple, and TrueBASIC versions of these programs. You can download the programs from this location. We also have experimental versions of the programs as Java applets written for us by Julian Devlin. The answers to the odd-numbered problems are available from this website. We would be happy to provide the solutions to all of the exercises to instructors of courses that use this book. Requests should be sent to jlsnell@dartmouth.edu. Errata found since the second printing of the book can be found in errata. We would appreciate hearing from you concerning additional corrections and suggestions for improvement. 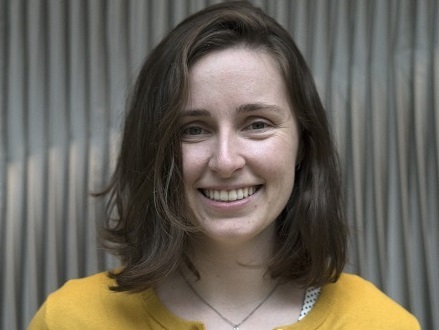 Send comments to jlsnell@dartmouth.edu or cgrinst1@swarthmore.edu. License: This work is licensed under the GNU Free Documentation License (FDL). This is a 2-volume textbook, consisting of a year-long course. The book is quite new but has already been used by a number of other faculty at other institutions who say that they recommend the book and would use it again. This book originated as lecture notes for the undergraduate analysis course at the University of Illinois in 2009, and so it follows the syllabus for that course based on the text of Bartle and Sherbert. This award-winning text carefully leads the student through the basic topics of Real Analysis. Topics include metric spaces, open and closed sets, convergent sequences, function limits and continuity, compact sets, sequences and series of functions, power series, differentiation and integration, Taylor's theorem, total variation, rectifiable arcs, and sufficient conditions of integrability. Well over 500 exercises (many with extensive hints) assist students through the material. License: this book is licensed under a Creative Commons Attribution 3.0 Unported. 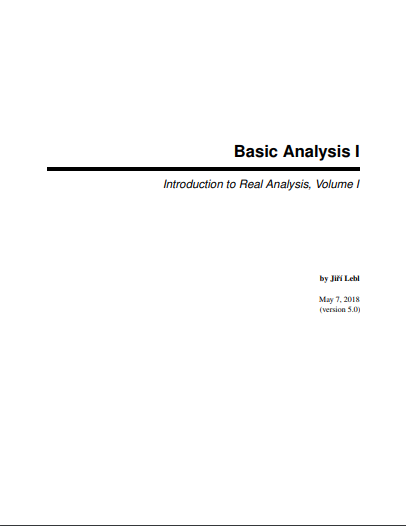 This text is designed for a year long real analysis course at the advanced undergraduate level. It is both a textbook and a well-structured problem set. It is carefully laid out so that nothing has to be relearned in the transition from real valued functions to vector valued functions. 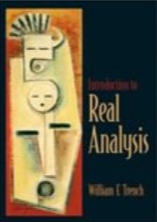 It can be used for self-study by an independent student or for review, and it provides an excellent background for the traditional graduate course in real analysis.